Expanding engineering firm, NIKKEN Kosakusho Europe is embarking on a long term partnership with Boeing as the US aerospace giant touches down in the Sheffield city region (SCR). With European headquarters on the Barbot Hall Industrial Estate in Rotherham, Nikken enjoys a global dominance of the rotary table technology market and supply manufacturers operating in the aerospace, defence, motorsport, automotive and medical sectors. 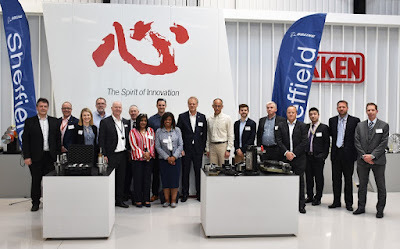 The Integrator agreement will see Nikken provide high precision toolholders, cutting tools and tool presetting solutions to the new £20m Boeing Sheffield facility. As Integrator and technical partner, Nikken will work closely with Boeing's engineering team to help them optimise their manufacturing processes to achieve their production goals and Industry 4.0 ambitions. 2015 saw the opening of a new demonstration and customer support centre - the NIKKEN Innovation Centre Europe on the nearby Advanced Manufacturing Park (AMP) in Rotherham - packed with advanced equipment to help companies become more competitive by increasing production rates and quality while reducing costs. Investing around £7m in new facilities on the AMP saw the company create its first production base outside Japan and is part of a move to get closer to its customers. Boeing is currently constructing its first facility to be built in Europe just over the Parkway on Sheffield Business Park. When operational it will produce actuation system components for Boeing's Next-Generation 737, 737 MAX and 777 aeroplanes. Boeing has embarked upon an R&D programme with the assistance of the University of Sheffield Advanced Manufacturing Research Centre (AMRC) that is developing the new manufacturing techniques that will enhance production efficiency and reduce costs whilst maintaining quality. Nikken is a Tier 2 member of the AMRC. Senior Boeing representatives were in the SCR recently to meet with the AMRC and its future workforce. Tony Bowkett, CEO at Nikken, said: "This is a very proud moment for the Nikken European team, resident here on the AMRC park. We have worked tirelessly to put together a total support solution that will allow the Boeing engineers to produce upwards of 10,000 parts per month, supporting its Portland facility in the USA. "It's a great opportunity for our engineering and logistics teams to integrate world class machine tools and equipment and to use their knowledge & experience to optimize their performance, resulting in productivity and efficiency gains." This year, Nikken is celebrating the 60th anniversary of its Japanese parent company, Nikken Kosakusho Works Ltd. that was created in 1958. The European arm was incorporated in 1989 and so will be celebrating its 30th anniversary next year.